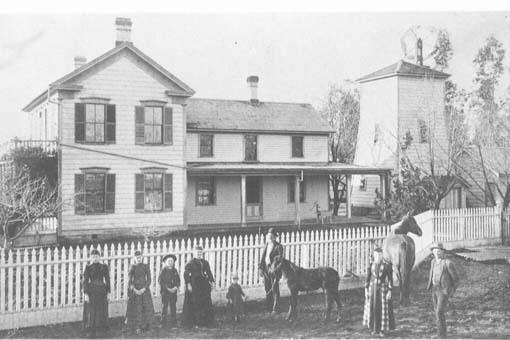 Sikes Home 1890. 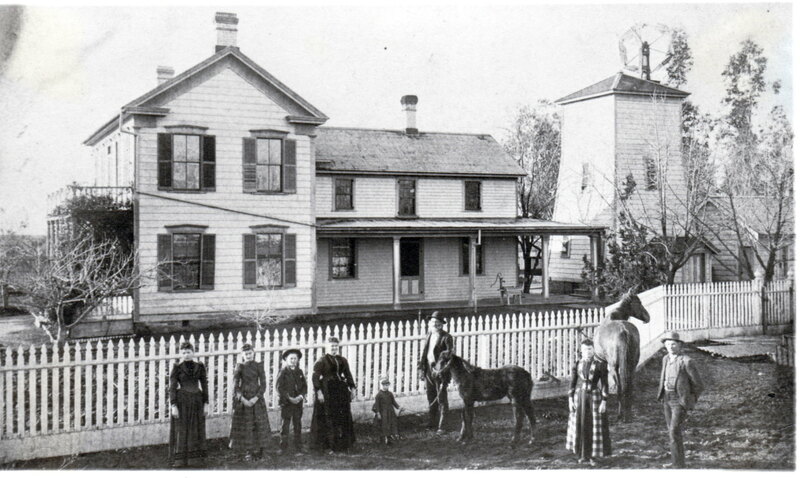 The lower two-story portion, to the right, was built sometime in the 1860's. The higher two-story section, to the left, was built in 1875. Clara Bell Sikes, Alice Irene Sikes, George Alvin Sikes, Caroline Woodley (Palmer) Sikes, Elsie Lenore Sikes, Jonathan Sikes, Maud Palmer and Frank Palmer. Plowing time on the Sikes Ranch .. Alvin with the lead team. The ranch consisted of the house, two barns, a bunkhouse for hired hands, a smokehouse, a shop, a tank house with a garage below, another small garage, a chicken house and a cold cellar. The tank house had a large elevated water tank which was filled by a pump attached to a wind mill and used gravity feed for a continuous supply of water. 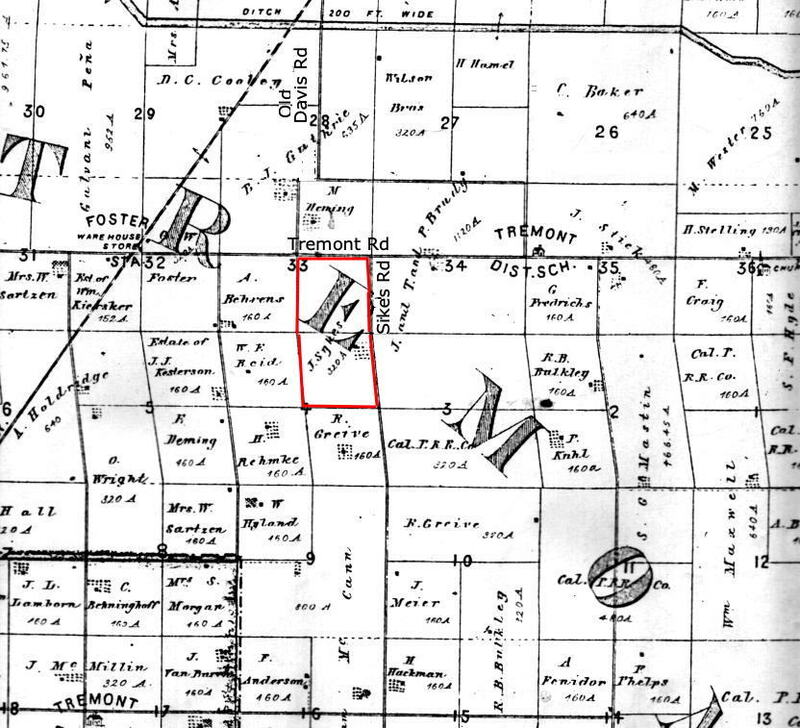 In 1869 Jonathan Sikes established a homestead on a quarter section (152 * acres ) in the Tremont District, of Solano Co. just south of Davis, Yolo Co. by obtaining a Homestead Certificate, signed by President Grant on June 1, 1869. He would could receive a patent (deed) if he resided upon or cultivated the same for the term of five years. See more at the Homestead Certificate page. He later purchased another quarter section of land from a preacher for the price of two mules. The ranch was operated for nearly a century by three generations of Sikes, Jonathan, Alvin, and Jack. When Jack died from Polio in 1953 the ranch was leased to a local farmer. During Jonathan, Alvin and Jack's time the primary crops were wheat and barley. Jonathan also had a herd of 100 cattle at one time. In addition they raised chickens, pigs and sheep to provide food, had a cow for milk, a horse to pull the buggy and mules to pull the plows and harvester. The buildings are all gone now and the land has been leveled so it can be irrigated by two large wells. It has class 1 & 2 type soil which allows a variety of crops to be grown. Current crops include tomatoes and beans and wheat. It is still owned by the family. * Normally a quarter section is 160 acres (one half mile by one half mile), but because of a government surveying error the sections in this area are slightly smaller. The Sikes Ranch is about 4 miles south of Davis at the corner of Tremont Rd. and Sikes Rd. Return to the Jonathan Sikes Page.